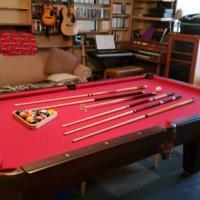 7' pool table. Cues and balls. Black felt. Excellent condition. Local pick up. Older restoration of ornate Brunswick Pool Table. 4 piece slate helps to date table. Professional moving and installation.